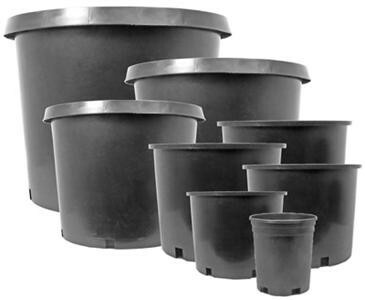 The premium quality, injection molded, nursery pots are much thicker and durable than traditional "blow molded" nursery pots. 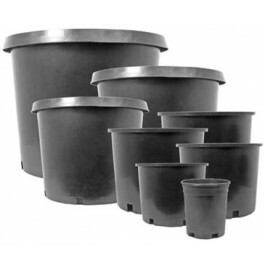 These are the best quality pots on the market. Grip lip for easy movement. Made in the USA. See our Premium Clear Saucers to find the correctly sized saucer for each pot. 1 Gallon - 5" x 6 1/2" x 7"
2 Gallon - 7" x 8 1/2" x 8 1/2"
3 Gallon - 8 5/8" x 10" x 8 7/8"
5 Gallon - 9 5/8" x 11 1/8" x 10 1/4"
5 Gallon Tall - 8 3/4" x 12 1/4" x 10 1/2"
7 Gallon - 12 7/8" x 14 1/4" x 11 5/8"